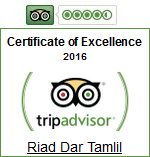 We really enjoyed our stay at Dar Tamlil. While its location is perfect in terms of distance to the main square, the surrounding streets are not as pleasant as the charming Riad itself. The room was clean and the facilities were okay as well (with your usual 'southern countries shower', which is not the cascade you're used to back home), breakfast was very nice. And, most important: The staff was extremely helpful in terms of taxis, directions, wishes, etc. We'd definitely stay there again!